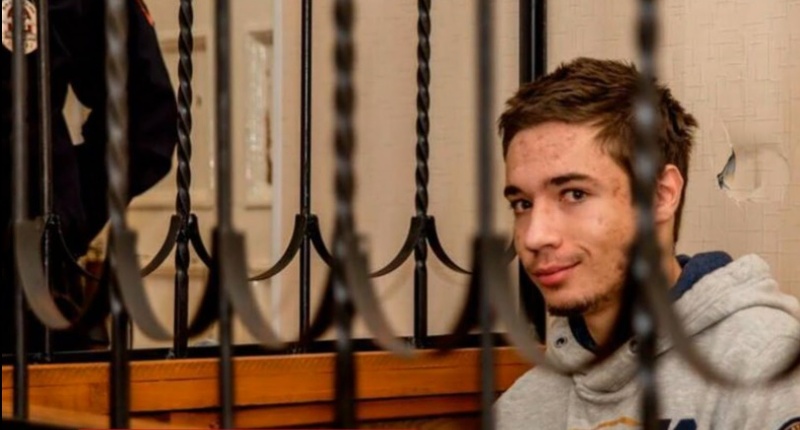 Ukraine's Ministry of Foreign Affairs has resolutely protested against a decision by a Russian court to extend detention of illegally arrested 19-year-old Ukrainian, Pavlo Hryb, until March 4, 2018, according to the ministry's press service. "The Ministry of Foreign Affairs of Ukraine expresses its strong protest in connection with a decision by the Oktyabrsky District Court of Krasnodar on December 15 to extend until March 4, 2018, the term of detention of Ukrainian citizen Pavlo Hryb, who was illegally detained in Belarus and then transferred to the Russian Federation," Ukrainian diplomats said. Read alsoСapture of Ukrainians by Russian special services instrument of "hybrid" war - British MP"The groundless detention of Hryb, the Russian side's ignoring of his rights, in particular, to the needed medical assistance, meetings with his parents and communication in his native language during a meeting with the consul is a convincing evidence of systematic violations by the Russian side of the rights of Ukrainian citizens held in penitentiary institutions and the failure of justice in the Russian Federation," the Ukrainian Foreign Ministry noted. As UNIAN reported earlier, a member of the State Border Guard Service's public council, Ihor Hryb, announced on August 28 that his 19-year-old son, Pavlo Hryb, was missing. Pavlo reportedly disappeared in Belarus on August 24 after he had traveled to the city of Gomel for a meeting with a Russian girl whom he met on social networks and who had allegedly also flown to Gomel. The youngster's father said Pavlo was supposed to return on the same day. When it did not happen, the father went to Gomel in search for his son. He found out that Pavlo was wanted by the FSB in Krasnodar Krai (Sochi) under Article 205 of the Criminal Code of the Russian Federation (an act of terrorism). Later it became known that Russian investigators had accused Pavlo Hryb of allegedly plotting a terrorist attack at a school assembly in Sochi. On September 13, a court in Krasnodar ruled to arrest Pavlo Hryb until October 17. Then, it extended the arrest term until January 4, 2018. Pavlo Hryb is diagnosed with portal hypertension, which requires daily intake of necessary medications and a special diet, without which there is a risk of death. On October 13, Ukraine's Foreign Ministry said that the Russian Foreign Ministry's office in Krasnodar had officially informed that Ukrainian doctors were denied a visit to Pavlo. On November 20, his father announced the deterioration of the teenager's condition.